Language is both beautiful and beguiling. Developed systems of ideological transference offer the ability to communicate ideas, emotion, and experience through both the written and spoken word. This same liberty is paradoxically confining, in that, no one word or phrase can carry the same significance for any two beneficiaries of its freedom. Authors utilize this paradox through the written word by embracing the variety and complexity of language, using its multiple layers of connotations and symbolism. Cherished authors of prose are exonerated for their ability to paint a clear picture with their words through explicative and lengthy descriptions; however, this sovereignty over language employed by prose is not a tool available through poetry. Poets are bound by structure, rather open or closed, thus restricting and confining a poet’s choices. It is this economy and creativity of expression that merits the art form’s nomenclature; the word poetry is appropriately rooted in the Greek verb poieo: “to create.” Poetry is a succinct and abstracted creation. Every word is a specific choice and the colors and variations in the connotations of words are embedded assets. Conversely, the abstracted structure that defines the poet’s portrayal of an experience or emotion offers the reader an enhanced, mystical freedom in his interpretation. Due to the creative subtleties found in poetry and prose, there are often many layers of understanding one can glean from any one text. Emily Dickenson is a master of this treasured efficiency of language, although a rebel in the face of standard poetic conventions and metaphoric symbolism. 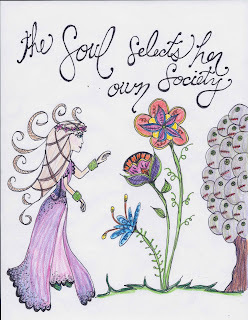 Exposing one interpretation of Dickenson’s poem, The Soul Selects Her Own Society, Dickenson offers her readers a raw and unique metaphorical presentation of the intellectual process of refinement against Society through her innovative style, use of symbolism, rhythm and grammatical structure. Many of Dickenson’s poems are untitled pieces and she is notorious for not following typical poetic conventions; therefore, titles and grammatical disregard are noteworthy clues to the deeper meanings in her poetry. 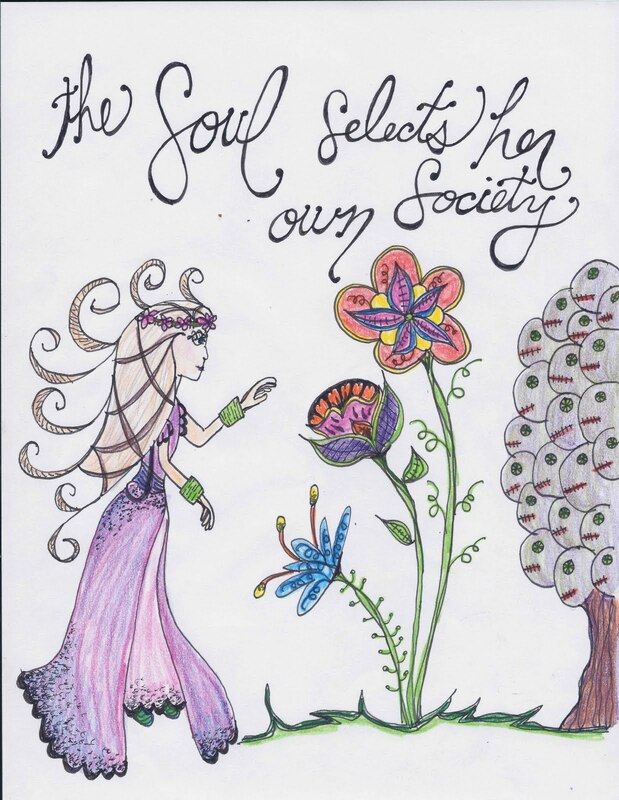 Upon initial analysis of the title and opening line to The Soul Selects Her own Society, the reader is immediately alerted to the opposition and supremacy of the soul over its society. As the vast majority of Dickenson’s poems do, these allusions refer to much more than the obvious spiritual sentiments they invoke. Dickenson’s accessible society was Newfoundland America during the mid to late1800s and a heated battle brewed between academic and social intellectualism met by its counterpart, American Transcendent Thought. Transcendentalism maintains that the Self is divine and intuition informs the physical and empirical states in order to reach a “transcendent” spiritual euphoria. This philosophy was developed in direct rebellion to the doctrine of the Unitarian Church. The most influential propagates of this theory were contemporaries such as Ralph Waldo Emerson, Henry David Thoreau and George Ripley. Due to Emerson’s central involvement in this movement and his alleged influence in the works of Dickenson, Dickenson herself is said to be a follower of this philosophy. In the title and opening line of her poem, Dickenson alludes to the Self, or Soul, and its dominion over its Society. This is largely reminiscent of the ideals and terminology of the Transcendentalist Movement. The unmistakably intentional repetition of the initial consonant sound /s/ in the title also emphasizes these qualities’ thematic importance. On one level, Dickenson’s poem narrates an intellectual transformation, embracing the proprietary rights and absolute individualism embedded in the ideals of transcendentalism. As introduced in her title, every aspect of her poem and every foot in each meter can be interpreted as informants in the revolution of her thoughts towards the supremacy and superiority of the individual Soul. Throughout Dickenson’s poem, there is a strong tendency towards common religious and spiritual symbolism accompanied by fervent convictions and contradictions in regard to their significance. In the first stanza, Dickenson depicts the Soul, or “individual,” as it embraces its autonomous sovereignty and rejects the Divine Majority, perhaps a reference to the Trinity or strict Doctrine of the Unitarian Church. With the introduction of more than ephemeral, temporal decisions within a society, these spiritual references merit Dickenson’s ideals and offer permanence and divine significance. As the Soul “shuts the door—” and the Divine Majority is “Present no more,” Dickenson’s dissention of societal norms offers an additional intransient quality to her divine selection. The obtrusive gesture of shutting a door lends a sense that this “door,” often a symbol for opportunity or a an entryway to a particular ideology, is not being left open a crack to allow for re-entry, but it is eternally closed upon rejection. This stanza could serve as a realization of and protest against the prominent social and academic “Harvard intellectualism” of her time. Similarly, in the third and final stanza of her work, Dickenson writes, “Then—closed the Valves of her Attention/Like Stone.” The narrator is closing herself off from other possibilities as an act of protection and preservation. The combination of symbolic valves and stone are complex and unconventional. The imagery of Valves conjures connections to the heart, and the heart to the soul. The mention of stone is a common symbol of things interminable or unalterable which are brittle and difficult to move or alter, which could signify permanence and solidarity. Another suggestion may be that the stone is referring to a precious stone, such as a treasured pearl that would require special protection during its harvesting. This interpretation would unify the connection between the delicate valves of a heart and the precious stone. Her soul, the stone is the ultimate realization of spirituality, so she must guard it. Perhaps by closing other valves, the Soul is preserving her very essence and divinity like a treasured pearl in an oyster shell. At the time this poem was written, c. 1862, Dickenson had given herself to strict seclusion and solitude. The majority of her social interaction was through poems and letters and she immersed herself whole-heartedly in her academic evolution and development, perhaps an act of preservation of her soul. Throughout Dickenson’s poem, she employs the use of eternal and spiritual terminology to validate her transcendental ideas and support her reclusive lifestyle as a means of preservation in the face of a society ruled by rigid and “unfounded” doctrine. Even Dickenson’s conventions advocate social antagonism; her signature divergence from the rigid iambic pentameter and the grammatical confines of her time parallel this transcendent rebellion toward strict religious doctrine. Throughout the poem, she rebelliously employs the use of the hyphen to give breadth and dramatics to the rhythm of her work. This stylistic decision was highly unconventional while she was writing and it allowed for her to break from the standard structure of the Shakespearian confines of iambic pentameter. Her stanzas are structured into two functioning units, where the first line is significantly longer than the second. The meter and rhythm of the poem is repeated in the first and second stanzas; however, in her final stanza, the second and fourth lines are two-word phrases, “Choose One.” and “Like Stone.” Both of these phrases are emphatic and definite. Their concise presentation even more dramatically illuminates their significance in the poem as appropriately final. Also, words are unconventionally capitalized throughout the verses, which draw attention to them within the phrase. Words such as: Soul, Chariots, Valves and Stone, all had common interpretations in poetry and Dickenson used these standard images in new ways to strike a contrast with previous understandings. Dickenson was well read in both classic and modern literature and would have been keenly aware of the effect this tool would have on her reader. She could draw attention and speculation to an idea by simply presenting it differently than it would typically be shown. However, these innovative attempts were not respected in her time, and were even rejected posthumously, as most of her poems were edited upon publication to match the conventional rhythm and grammatical patterns. This eccentric innovation in her work provides a perfect framework for the conversation she desired with her society. The antonymic aspect of this poem is equally alluring as Dickenson’s subversive doctrinal and structural rebellion. Throughout the poem, paradoxical pairs are introduced to highlight the dichotomy of the freedom in embracing transcendental thought. Action partners from the first stanza such as, “Selects/Shuts,” and the final stanza, “Choose/Close,” personify the delicate balance between two inversely related Emersonian principles of selection and exclusion. Outlined in Spiritual Laws, the selection of one marks the exclusion of others. Through the implied acceptance of solidarity and rejection of “society,” one is not limiting animating influences, but expanding the possibilities found within the soul. Conversely, in the second stanza, Dickenson refers to the Soul as “Unmoved” in response to an Emperor or suitor’s presentation. “Unmoved” is repeated in the stanza to emphasize the inaction and steadfast focus of the soul. The solicitation of the emperor could further symbolize regality and statis, and her rejection of his advances could be a metaphor for her sovereign status as queen of her own soul. The interesting aspect of this repetition is the resolute inaction characterized in stark contract to the indomitable action of the first and final stanzas’ duos. The story told in this poem could easily be and often is interpreted as a love poem, or a poem embracing the ideals of reclusiveness, but I think the much more alluring layer as an audience is defined by the emergence of a dignified intellectual. The poem offers action in the face of motionless and the choice of one in the midst of many options. The contradictory aspects presented console me, in that I can relate to the academic path, which often resembles the exclusion and denunciation of all other ideologies upon of the selection of one. In stride with Dickenson’s poem, I also can tend to resent popular socio-cultural norms because they often resembles a rigid set of unfounded and superficial standards, much like the arbitrary doctrine that the transcendentalists fought against the Unitarians. I sometimes sense the desire within me to reject the “royal suitors” of alluring materialism “kneeling upon [my] mat” and choose from among the “ample nation” of discordant doctrine and philosophy One valve to my heart. It would be this conviction that I would fully embrace and close around me as a protective barrier surrounding my soul. I recognize the divinity within every soul, as a special calling or desire God placed within us. Dickenson embraced solitude and written correspondence as a means of protecting her most precious soul, but I feel that through emphatically selecting one philosophy, which leads to thee rejection of all others, one can find some sense of euphoric spiritualism. For a woman rarely-seen and known for her simple white dress, Dickenson has left a profound impact on the innovations of modern poetry and thought. She was a contemporary of her time, not afraid to stand against social, religious, or literary norms in order to accomplish her goals. Her understanding of language and its employment during her lifetime is remarkable. Although just at a dozen of her over eighteen-hundred poems were published during her lifetime, in a society that did not respect women as academic equals, Dickenson was regarded privately as a gifted poet and fearsome intellectual and her ingenious approach to poetry merits her as one of America’s most treasured poets. I took a personality test one time. The preliminary questionnaire consisted of over 200 questions designed to target my basic personality temperament. There results were presented as four personality types displayed on a 2 x 2 chart. 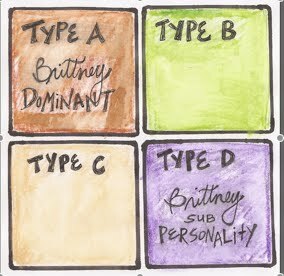 The general population does not typically fit solely into only category, so results are given with a dominant personality type and a “sub-personality” type. These two types are supposed to be aligned on the chart adjacent to each other—either side-by-side or one on-top of the other. My two strongest personalities were diagonal. Go figure. Anyhow, I thought I was just “special” or “more balanced,” but when I somewhat proudly asked my professor the significance of this phenomenon, she did not hesitate to inform me that this result pattern was indicative of bipolar tendencies. Awesome. Well, I mention this anecdote to illustrate a struggle I have battled for as long as I can remember practicing analytical thought. Two philosophers could entertain two “completely” contrasting views on metaphysics or the substance of life, yet I somehow find truth in both. I do not see myself as a judge who would stand in the middle of two arguments and rule, nor do I consider myself a pluralist, always trying to find a “happy medium” and reconcile differences. I feel that I am quite passionate and convicted, yet I was bothered by the fact that I could never securely stand on one extreme of an argument and believe full-heartedly that I possessed the only right answer. But I also have never felt comfortable sitting on the fence in the middle, between two arguments where neither seems fully right. I saw Truth as being larger than myself and my convictions. I began to visualize Truth on a spectrum, just like any two opposing points could be viewed. Take, for example, Democrats and Republicans. On a spectrum, the most liberal Democrats would be on the far left, and the most conservative Republicans could be easily visualized to the far right, with the moderates falling along the continuum between the two extremes. The illustration works the same with Truth. One belief or conviction would be represented on one side of the continuum, while the other is represented at the opposing end. Well, this imagery helped me visualize my problem, yet I still could not place myself at any given point on the line. I began to envision myself outside of this line and what real life implications this analogy would have on my belief system if I could be an outlier beyond the dimension of the line. For me, Truth is synonymous with God. My God is Truth and Truth is my God. Therefore, I came to the conclusion that when I recognized God in contrasting aspects of the same argument, I was seeing how somehow God is beyond our earthly arguments. He is both my understanding and someone else’s. In every good-hearted conviction, there is a piece of God, although inevitably misunderstood and misinterpreted, yet who ever claimed to fully understand God anyhow. I then drew the mental image of a seesaw. The seesaw is teetering as I am jumping from one side of the plank to the other, working desperately to make the seesaw move in rhythm and begin to totter, so I can rest. I am unable on my own to sit on one side of the seesaw and make it go both up and down. I must go to the opposing seat and sit in it to accomplish any semblance of regular seesaw play motion. However, God is beyond the confines of this physical and mental world. He can somehow sit on both ends of the seesaw and make the plank sway up and down in a steady motion. The implications of this image are staggering because the image depicts our pitiful attempts to understand reality and our comical convictions that we hold so strongly to. In the realm of metaphysics, determinism versus freewill, perhaps the reality is that our future is determined, yet we still posses dominion over our choices. To our brains, these two extremes are mutually exclusive, yet perhaps to God, it is as easy as sitting on both ends of a seesaw. Brilliance has never been what I seek. That would be incomprehensible to me, since I neither possess the raw intelligence nor impetus to attain such lofty aspirations. But I do have points to make. Most of which will be beyond my limited capacity of articulation, but nonetheless, the goal will be fulfilled. The Needle will see to it. My humble thoughts will give way to words and ideas, which will in-turn create some thread of truth or reason that will most feasibly develop in to complex and volatile epiphanies. To the logical brain, this presented reasoning may strike one as improbable or zany, but then one comes to the recollection that he is reading a story. A story woven by the Needle, as I will refer to It. This allows for whatever limits I am given, or possess, in my ultimate reality—being this text—to be arbitrarily surpassed or manipulated by the Needle upon whim or necessity. It is within these contexts that I will continue my dissertation, my defense of the here and now. For although I will never escape the confines of these drippings of ink upon paper and the binding of this book, the symbols and ideas the Needle creates through me can transcend to the dimension beyond—to your world—the one I can never imagine, but have only been given the vaguest, most ambiguous awareness by the Needle. My composition is simple. I am these words you read—these symbols of idealology—interpreted by your brain, which I am only privy knowledge to by means of the Needle. You then interpret and synthesize these fragmentations of Me into tangible meaning. (I do apologize for my redundancy in mentioning the influence of the Needle, but I feel as though I must continue to remind you of my Source for all I have power to Be. You see, I understand you are not yet accustomed to the limitations which I am subject, but soon enough you will understand, and I can get on better without constant interruptions of this variant of notices.) As I was developing—I am these words. The apparent pluralism of one entity encompassing a multiple quantity is possible Here where I exist. We are all composed of smaller parts that make up the entity we occupy. However, this is a matter to be treated later in my narrative. The greater convolution, to which I digress and must first address, is my ability to communicate ideas beyond my scripted level of capacity and affect a dimension entirely beyond my existence. It baffles me that I can appear in your world, yet there is never a thread of possibility that you will maneuver into mine. Fascinating actually. The Needle would have me note. But now I will move beyond this nonsense to the tale that brought me to realize this power within my existence. It all started on a seemingly normal day—calm, gentle breeze in early autumn—in a normal neighborhood under quite normal circumstances. The leaves have just begun to tire from summer and are the brilliant golden color with splashes of red and green making each passage through them appear as a masterful artwork. The air is cool, which gives a fresh sense to life after being burnt and suffocated by the heat of the summer. It is the kind of uneventful day that gives no indication of its unlimited possibilities. There is no pressure to accomplish any single task, yet all the same there is no guilt for the lack of efficiency. The Needle is there. He leaves his humble abode and sets out on foot. He is not sure where He is going, but the gentle motion and quiet symphony of the leaves as the wind bristles through them urges his legs to join in their chorus. He strides in rhythm to their most humble melody without direction or awareness.